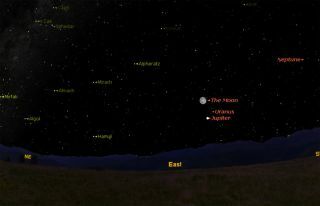 This sky map shows where to look for Jupiter and the moon, as well as the locations of other planets, on Thursday, Aug. 26, 2010 from the northeast United States. For many weeks, the planet that has dominated our eveningsky has been brilliant Venus, visible low in the west-southwest sky for about90 minutes after sunset. But after Venus sets, it is Jupiter that takes overfor the rest of the night, outshining everything in the night sky but themoon. This week, Jupiter- the solar system's largest planet - rises around 8:45 p.m. local daylight time.On Thursday evening, if you?re facing east soon after 9 p.m. you'll see the nearlyfull moon standing about 6 degrees above Jupiter. Your clenched fist heldat arm?s length measures about 10 degrees in width, so just over ?half of afist? will separate Jupiter from the moon. The two objects will remain visible through the rest ofthe night, peaking toward the south at around 3 a.m., at an altitude thatmeasures more than halfway from the horizon to the point directly overhead (thezenith). Thissky map shows where to look to spot Jupiter and the moon Thursday night. In the coming weeks we will see Jupiter loom as large andas bright as it ever can get from our earthly vantage point, because it'snearing perihelion: that point in its 12-year orbit that places it nearest tothe sun. Even steadily held 7-power binoculars will show Jupiteras a tiny disk. A smalltelescope will do much better, while in larger instruments, Jupiterresolves into a series of red, yellow, tan and brown shadings, as well as awealth of other telescopic detail. Amateur astronomers have been imaging thisbig planet all summer long as it has been approaching the Earth. Opposition, when it will be nearest to Earth and in thesky all night long, from sunset to sunrise is less than a month away, on Sept.21. And don?t forget Jupiter?s four major moons, discovered400 years ago by Galileo. They serve as a constant delight to amateurastronomers and can be seen in any telescope and even binoculars. They orbitJupiter so quickly (1.68 days for Io to 16.7 days for Callisto)that they change their appearance from night to night. When you look at the moon and Jupiter on Thursday night,you might ponder the difference in both their sizes and distances. The moon, of course, far outshines Jupiter - by more than9 magnitudes, or a brightness ratio of 4,370-to-1. But the moon is also muchsmaller than Jupiter. The moon?s diameter is 2,158 miles (3,473 km), whileJupiter?s is 88,846 miles (142,984 km). What makes the moon loom so much larger and brighter isits distance. On Thursday night, the moon will be 251,200 miles(404,270 km) from Earth. But Jupiter will be 1,496 times more distant: 375.9million miles (605 million km) away. "My son, Johnny woke me up at 2 a.m. tolook at a "star" that was moving. His friend had called him and toldhim about it. Johnny walked over to his house (he lives a house away) and theycalled another friend to come over. The three of them were watching this"star" go back and forth. Do you know anything about this?" I?m pretty certain that the "star"that Johnny and his friends saw was Jupiter. So why did it appear to move?Likely they experienced what is called the "autokineticeffect." This is a phenomenon of human visual perception in which a stationary, smallpoint of light in an otherwise dark or featureless environment appears to move. Many sightings of UFOshave also been attributed to the autokinetic effect'saction on stars or planets. Psychologists attribute the perceptionof movement where there is none to "small, involuntary movements of theeyeball." The autokinetic effect can also beenhanced by the power of suggestion: If one person reports that a light ismoving, others will be more likely to report the same thing. Currently, Jupiter is shining in the constellationPisces, a star pattern that consists chiefly of faint stars. Under aclear, dark sky with no moon nearby, Jupiter will appear to shine with littleor no competition from other nearby stars. If a person stares at Jupiter over a span of perhaps 15to 30 seconds, it?s quite possible for the autokineticeffect to kick in and cause Jupiter to gyrate or perhaps move in a smallcircle. Next week, when the moon has moved out of Jupiter?svicinity and the surrounding sky is dark, try staring at Jupiter and see ifit?ll move for you like it did for Johnny and his friends.